Over the years, the environmental movement has written hundreds and hundreds of reports and had thousands of meetings with decision makers, and while these things remain important, what we really need is people power. We need decision-makers to realize that Canadians want climate change to be taken seriously for a clean energy future. 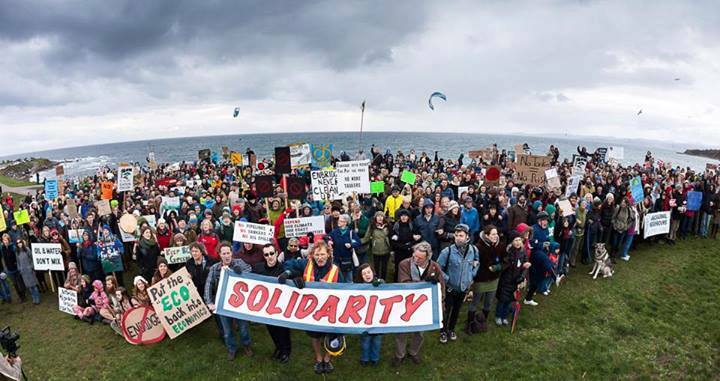 Over the weekend thousands of Canadians united in over 130 communities from coast to coast to coast to demand a safer climate and a cleaner energy future. Saturday's national day of action to defend our climate and our communities from tar sands and pipelines was a powerful day for me. I work in Ottawa, and it can be tough to be at the heart of politics that are driving the problems rather than the solutions. The truth is, I needed Saturday. I needed to be reassured that Canadians are ready to stand up for what they believe in, and that this movement is growing. We are up against some of the wealthiest companies in the world, companies that depend on pollution for profit. And in Canada, we are facing governments that are doing everything they can to ensure nothing gets in the way of the oil industry. After all, this is about a safe climate now for people around the world, and a safe climate tomorrow for our children. Every parent wants the best for their children, and that is not what we are offering to give them right now. If we allow business as usual, we will be handing over a planet rife with disasters far worse than the tragedy we are already seeing today in the Philippines, the U.S. Midwest, and even our own backyards. Former Irish Prime Minister and United Nations High Commissioner for Human Rights, Mary Robinson, said over the weekend amidst the ongoing United Nations climate talks in Poland that, "[W]e need a forward-looking leadership, and that won't come from Canadian politicians unless it comes from the Canadian people." And being here in Ottawa, I can assure you that she is absolutely right. We need to demand the future we want and we need to do it loudly, often and clearly. We need more days like Saturday. Saturday gives me the confidence to walk into a meeting and assure people that building fossil fuel infrastructure like new pipelines will never be easy again. That Canadians care more than ever about the environment, our shared climate and a clean energy economy. And that this movement is growing. We will keep coming together, in bigger and bigger numbers until these demonstrations become celebrations of the clean and safe energy future that we deserve.